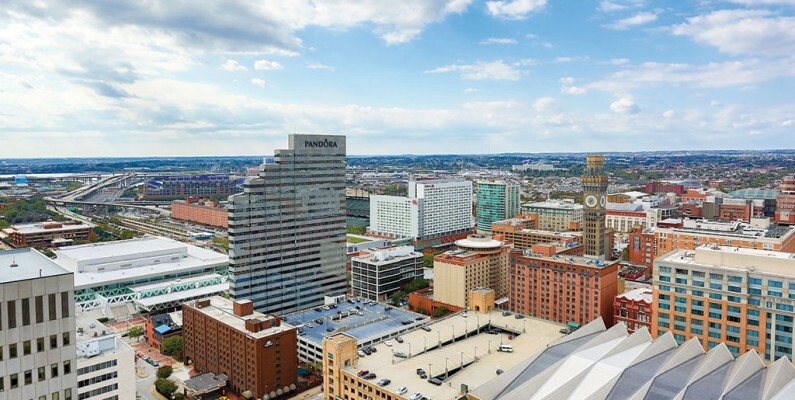 2Hopkins is more than the most elevated new apartment in Baltimore, MD. It’s also one of downtown’s finest representations of mid-century architecture. That makes its façade iconic. But it also makes its interiors unique—particularly in the building’s devotion to gorgeous sightlines. You can’t find views like these anywhere else. Every apartment home at 2Hopkins features open spaces with floor-to-ceiling windows. It’s a style of design that brings attention to the views, making them seem like a dramatic—and beautiful—piece of art. You’ll love walking in at the end of the day and seeing the city lights stretching into the distance. And you’ll love opening your blinds in the morning and allowing natural light to fill your home. Best of all, no matter which of our studio, one- or two-bedroom homes you choose, you’ll have an elevated view. Because our homes don’t begin until the 11th floor. What view would you prefer? You can choose a home that looks out toward the sparkling water of the harbor. Or, you can choose a home where the Baltimore skyline fills your windows. We even offer a few, select homes that give you a view into Oriole Park at Camden Yards. No other Baltimore apartment offers such a perfect combination of interior design and available views. At 2Hopkins, luxury is truly on another level. Schedule a tour of 2Hopkins today!